American beautyberry photographed at Seacrest Scrub Natural Area, Boynton Beach, Palm Beach County, in July 2014. American beautyberry, Callicarpa americana, lives up to its name, at least in a literal sense. The fruit is beautiful. Tasty, however, it is not. Unless you're a bird or a hungry squirrel. 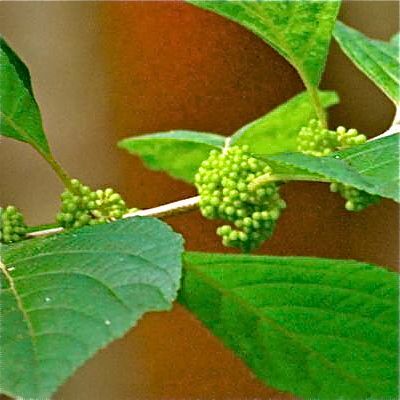 Beautyberry is a common shrub native to Florida and pretty much the entire southeastern United States. It's found in wooded areas and is easily identifiable, depending on the time of year, by the clusters of flowers that in turn produce large clusters of purple berries found along its branches. 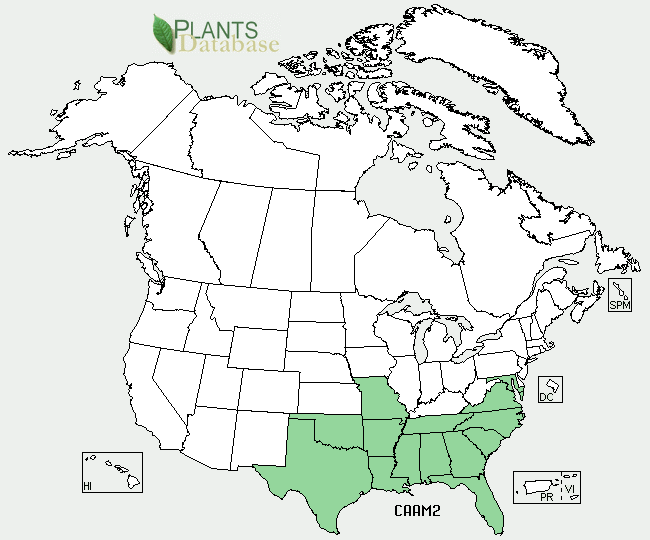 It grows as far north as Maryland and as far west as Texas. Northern Mexico and the Caribbean also are in its range. 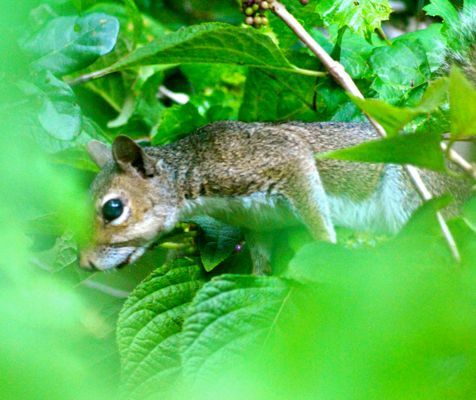 The beautyberry is a favorite food for more than 40 species of song birds, squirrels (like the guy below foraging in a beautyberry bush), raccoons, opossums, foxes and armadillos. Deer also eat the berries and will browse on the leaves if they can't find other food higher up on their favorites list. 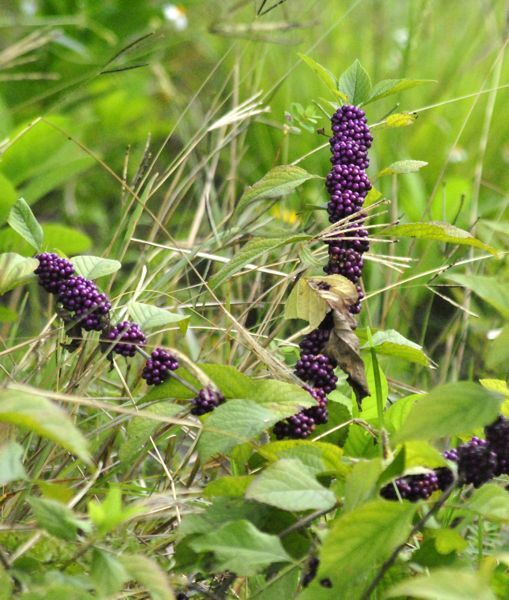 Beautyberry provides as much as 18 percent protein, enough to sustain a deer, or as little as 8 percent, depending on the time of year. The berries are edible, but have a mealy texture and don’t taste very good (although they are used in jellies). Native Americans used various parts of the plant to treat a variety of ailments, including malaria, dysentery, rheumatism and colic. They used the roots to treat dizziness, stomach aches and dysentery. They boiled roots and berries to make a treatment for colic. Farmers in the early 20th century woud crush the leaves and place them under the harnesses of their horse to repel mosquitoes. They'd also rub crushed leaves on their own skin for the same purpose. Researchers at the U.S. Department of Agriculture have found two compounds in beautyberry that do the trick — callicarpenal and intermedeol. Researchers have found callicarpenal to be as effective as the synthetic and widely used compound called DEET. It also worked against ticks. 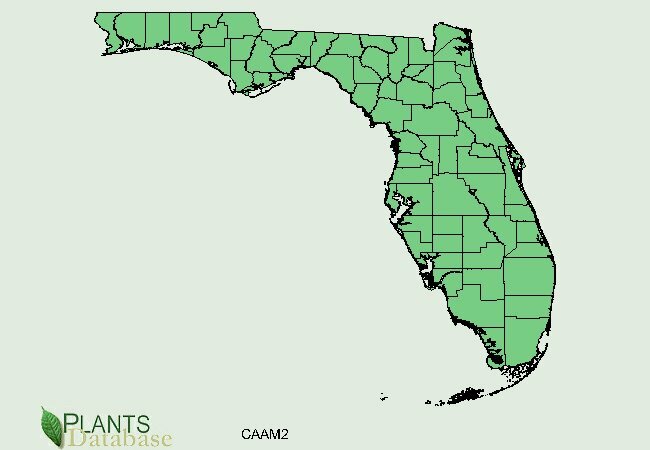 Researchers have found the two substances, technically called terpenoids, repelled fire ants. Intermedeol was the more effective of the two. Commercial use, however, would require EPA registration, and cheap ways to obtain the chemicals would have to be developed. In South Florida, beautyberry flowers and bears fruit year-round, although summer and fall are the peak seasons. In colder parts of beautyberry's range, the fruit, technically called drupes, ripen in mid-to-late summer. The flowers are pink, sometimes white. The leaves, are simple, alternate on the stem, with serrated edges, four to six inches long. Beautyberry can grow to about nine feet tall and spread about as wide. 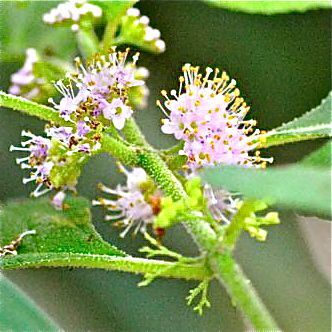 Beautyberry is found in hammocks and forest edges, but it does not tolerate shade well. It is a rapid grower, tolerates fire and is considered a pioneer species, meaning it will be among the first plants to grow in a newly created opening in a forest. It is used in landscapes as an accent and as a screen. It's fairly easy to grow, either by seed, cuttings or transplanting volunteer seedlings. Other common names include French mulberry, sourbush, bunchberry and purple beauty-berry. It is a member of Verbenaceae, the verbena family. United States Department of Agriculture (USDA) distrbution maps for Americn beautyberry.